I've blogged about Will Fries, a 6-6 270 pound OL from Cranford, NJ a couple of times before. This article from yesterday by NJ.com updates his recruiting. Rivals three-star recruit. Will take a visit to Boston College according to Rivals. Fries is up to seven FBS offers. The article reports Fries wants to major in business and marketing, so UMass' Isenberg School of Business would be a good place for him. Seven MAC teams are in play for a bowl bid. A BYU blogger looks at some schools who might have it tougher than the Cougars. UMass is one of them. Buffalo News says UMass will likely be a tough final game for the Bulls. James Ihedigbo talks matchups and playing for Detroit on Reddit. Vladimir Ducasse is the starting RG for the Vikings. Brandon London had a confrontation with some Red-Black fans. Sports Illustrated analyzes the first round of the College playoff rankings. Jean Sifrin was chosen the John Mackey TE-of-the-week for his performance at Toledo. Nice image of Jean. UMass A.D. John McCutcheon says Mark Whipple is positioning the Minuteman program for future success. Yes he is, and suddenly a conference bid no longer seems like wishful thinking. The Independent Collegian talks about Toledo's defense against UMass. Quote from the article:"This isn’t an attack on Toledo’s D, which simply doesn’t match up with the talent level on UMass’ offensive side of the football, even at full strength." In nine weeks things have really changed. The defense of the consensus best team in the MAC, with full scholarships, is considered to have less talent than the Minutemen offense. The MAC Reporter Online ranks UMass 9th in conference power ratings. Keepers College Football ratings has UMass at #116. Hey we're ahead of UConn! Football Scoop says MAC cost-of-attendance puts everything in perspective. SI.com says vague college football playoff criteria is going to cause trouble. Article on Chelmsford HS band playing at UMass Band Day. An article on Band Day on the UMMB website here. The Toledo Blade thinks the Rockets defense did OK against UMass. Uh, that's one way to spin it. Campus Insiders rates the UMass-Toledo game as the most entertaining of the MAC games last Saturday. The MAC Conference and Boise State support paying athletes the full cost of attendance. East Carolina is the only "Group of Five" team in the initial College Football Playoff rankings. Kent State plays Toledo this Saturday and Flashes HC Paul Haynes says Toledo will be the best team Kent has played since Ohio State. More on Miami (Ohio)'s new indoor training facility. Blake Frohnapfel's old team is undefeated, but unlikely to make the College Football Playoffs. Sports Illustrated reports Victor Cruz is rehabbing his knee after surgery. This article says Michael Cox has been the lone bright spot on the NY Giants special teams. Cox's stats here. Video of a high school kicker hitting a 70-yard field goal. Unfortunately he's already signed by Oklahoma. Quotes from Coach Whipple on the weekly MAC teleconference. Dan Malone reports Whipple does not give an injury update on Jovan Santos-Knox and Kessan Messiah. Blake Frohnapfel was named MAC East offensive player-of-the-week. Dan Malone on Frohnapfel's second MAC offensive player-of-the-week honor. Malone says Mark Whipple is not worried by the long two-week plus bye period. Dan also says this year proves better days are coming for the UMass football program. Yes they are. Matty Vautour looks to see if there will be any changes after the Minutemen come back from their long break. Jesse Allen says big things can still happen in 2014, but lots of things would have to break right. 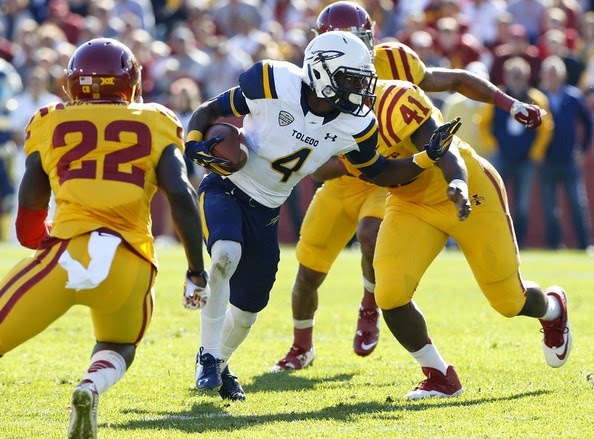 The Toledo Blade says even with an injured ankle, Kareem Hunt was too much for UMass. Ben Roethlisberger donates $1 million towards a Miami (Ohio) indoor practice facility. ESPN reports 107 college football teams have been eliminated from the 2014 college football playoffs. Blake is 2nd in passing yards in FBS. Second in all of football!!! He's 9th in passing yards per game. UMass is averaging 30.8 points/game. Last year we were #122 out of 125 teams with 11.7 points per game. Tajae Sharrpe is 4th in receiving yards. The UMass website has highlights and video interviews from the Toledo game. Frohnapfel says the rest of the season is about pride. Dan Malone has an article on the post game video interviews. Ron Chimelis says Coach Whipple has made UMass football relevant again. Hustle Belt moves UMass up to 9th in conference power ratings. Cleveland.com says Kareem Hunt kept the Rockets rolling. EMU stadium at kickoff. The announced crowd was 19,654. As I said in yesterday's pre-game post, UMass is still missing a few components to play with the top teams in the MAC. As usual, the offense was excellent. 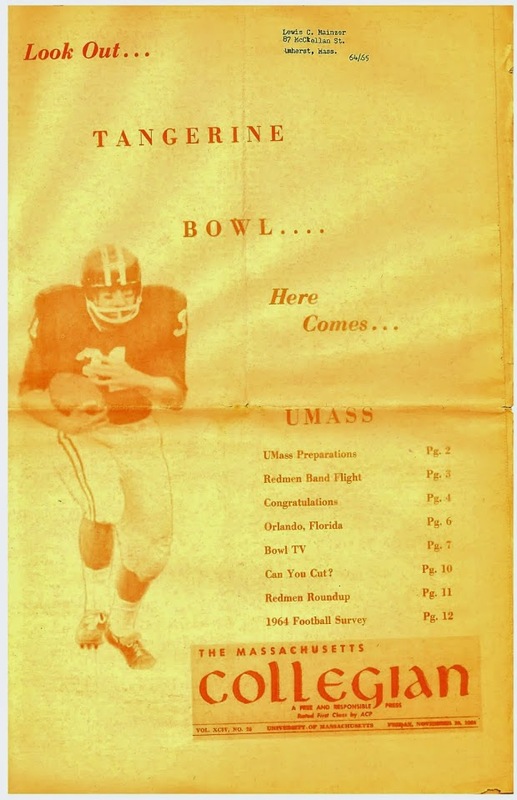 Frohnapfel's 438 yards was third-most in UMass history. The Minutemen were right in it until the end. Toledo has run up big scores and big rushing totals against just about everyone they played. You can't really blame the defense. The game showed what we all knew: UMass still needs some improvement to win the MAC. The Rockets have an All-conference kicker and he was going to win the game at the end if allowed. The UMass defense made some big stops and two INT's, but we couldn't make one more in Toledo's last drive. Still, if you like football, that was an entertaining game, with lots of big plays on both sides. The ESPN3 announcers were irritating homers and that was a blatant cheap shot that knocked Kassan Messiah out of the game. Eleven of 79 voters in the scoring poll correctly picked the Rockets by 7 to 13. Dan Malone says UMass can't complete comeback and falls to Toledo. Dan reports on Whipple's decision to let the Rockets score on the final drive. Kevin Hunt lived up to the hype. Matty V. says the Minutemen put a scare into Toledo. He reports UMass is still intent on finishing strong. A Hustle Belt writer says the Rockets rallied past UMass. abc40 says the UMass win streak stops in Toledo. The Blade said Toledo was good enough to get past UMass. The UMass Daily Collegian reports the UMass defense couldn't stop a late Toledo surge. All the MAC conference scores here. Catching up on the Minutemen's OOC schedule. Boston college finishes with Louisville, Florida State and Syracuse. It could be tough for the Eagles to be bowl eligible. Penn State still has Maryland, Indiana, Temple, Illinois and Michigan State. Wow, great football game. Frohnapfel threw for 445 yards and tied a UMass record for single game TD tosses with 5. If Toledo is the best team in the league, the Minutemen are not far behind. We need a couple of studs on defense--- and a kicker. Coach Jimmie Reid used to say playing in big games was the reason to play football. Today's game against Toledo is the first big game of UMass' FBS era in the sense there is actually something actually riding on the outcome. I'm pleasantly bemused by this because it's really too early in the Coach Whipple's second stint for a big game. The Rockets are starting more seniors on their offensive line than UMass has on on its entire squad. The Minutemen also really need a second tranche of Whipple's recruits. I'm bemused because I think we have a chance in this game. Pass defense is not Toledo's strong suit and if Western Michigan can slow down the Rockets' offense, then the Minutemen's defense could do so too. UPDATE: Rocket RB Kareem Hunt expected to dress for the UMass game..
Dan Malone has when and where to catch today's game. Dan says the stakes are raised for the Minutemen -Rockets game. Matty V. reports Toledo is the biggest game of UMass' season so far. Two Hustle Belt writers think Toledo will cover the spread of 17 points. The Boston Herald says UMass looks to shoot down the Rockets. The Toledo Blade says thanks to the Minutemen's passing game, UMass carries confidence into today's game. Cleveland.com reports the Rockets look to remaining undefeated in MAC conference play. The MAC conference website has Game Day #9. Matty Vautour reports UMass puts its win streak on the line in Saturday's vistit to Toledo. MAC Reporter Online has the Minutemen ranked #10 in its latest conference power ratings. The Daily Collegian says UMass is looking for its third straight win at Toledo. Max Moore and Ian Davis of Hustle Belt talk smack about the Minutemen-Rockets matchup. The Times Online says Terry Swanson continues to shine for the Rockets. The Rockets have every offensive line coach's dream: five senior linemen. WR Corey Jones 5-8 165 is the Rockets leading receiver. He's gone 48-535 11.1 AVE 2 TD's 64 LONG. His Toledo bio says he was a Scout.com four-star recruit. MLive writer David Drew picks the MAC winners for Week #9. Western Michigan was 0-6 at this time last year. This time, like UMass, the Broncos are hoping for a three game wining streak. Nick Saban explains the decision process: Kickoff or Receive? Dan Malone has a story about Marquis Young, a 6-0 200 pound RB that verbaled to UMass yesterday. Young is averaging 10 yards/carry at Milford Academy. Hudl.com has highlights and reports a 4.38 40 for Young. This article has Young talking about his decision to do a prep year at Milford. Young also drew interest from FBS Old Dominion. Dan Malone does a podcast with Nick Piotrowicz of the Toledo Blade discussing the upcoming Rockets-Minutemen contest. UMass WR Marken Michel is making progress recovering from injury. Mark Whipple discusses implementing his pro-style offense in a college program. Matty Vautour has a story about Josh Bruns filling in for injured center Matt Sparks. The UMass Daily Collegian says UMass looks for its third straight win against Toledo. A Rockets WR rectruit decommits. Toledo kicker Jeremiah Detmer is on track to be named All-MAC Conference again. Detmer is 12-15 80% 41 LONG. He's also 26-27 in extra points. FanIndex.com picks the ten best college bands and includes one from the MAC, but it's not the UMMB. NJ.com has a story about Chip Kelly visiting Victor Cruz in the hospital. Meanwhile, massive academic fraud in the UNC program. Dan Malone ranks college football teams after last week's games and moves the Minutemen up a little. Dan also talks about for the first time in FBS, UMass has some big game pressure. Matty Vautour reports the UMass seniors wish the Minutemen resurgence happened earlier. Ya gotta wonder where we'd be if Whipple was hired in 2012. Probably no MAC exit and we'd be wondering what bowl UMass would be in. The MAC conference has added another bowl tie-in. Hustle Belt also has a post on the new MAC bowl connection. USA Today has a post about Week #8's winners and losers and says break up the Minutemen. Phil Steele as how teams compare to their opponents offensive and defensive averages. UMass' four BCS games skew the results for the Minutemen. NIU looks down the road to its machup with Toledo. The Toledo Blade says a two-week bye (which UMass starts after the Toledo game) is awful. Cleveland.com grades the MAC East after eight games. And they grade the MAC West. The Buffalo News says the Buffs are looking at an uphill battle to sign a coach from a power conference. Ed Orgeron has some advice for the the Buffs. Is there a SEC bias on college football polls? Toledo has its game notes for UMass up. The Rockets website has three video previews for the UMass game on their game notes page. Blogger won't do a direct link. The Rockets lead the MAC in scoring offense (34.0), total offense (503.0) and rushing defense (113.9), and rank No. 2 in rushing offense (241.7). Terry Swanson was their lead RB against Iowa State. He's gone 63-489 7.8 AVE 48 LONG. They also have Kareem Hunt. All he's done is 59-527 8.9 AVE 7 TD's 45 LONG. Toledo's coach Matt Campbell is impressed with the Minutemen's turnaround under Mark Whipple. Dan Malone has three up and three down after the EMU win. Dan also has UMass opens a two-touchdown underdog to the Rockets. Keeper's College football ratings has Toledo by 10.93. Whipple has updates on J.T. Blyden's injury and more. Matty V. says the Toledo game is the first "Big Game" of the FBS era, in that there is actually something riding on the results. Jesse Allen of Hustle Belt says the consensus MAC last place team isn't in last place. Abrokwah was honored as a co-player-of-the-week by UMass athletics. Mark Whipple's quotes from the MAC's weekly teleconference here. The UMass Daily Collegian reports UMass is seeing improvements on both offensive and defensive lines. If someone were to ask me who the best team in the MAC is so far in the 2014 season, I would reply the Toledo Rockets. Toledo is 4-3, but their three losses are to Missouri, Cincinnati and Iowa State. They've beaten Ball State, Western Michigan and Central Michigan. The Rockets also hung 54 points on New Hampshire. UNH is undefeated in FCS and is a good bet to win the CAA North and probably the CAA title and auto-bid. Knocking Liam Coen 2175 2005 out of the top ten. Video of Mark Whipple and the UMass players discussing the win over EMU. Ya gotta be happy for the players who have endured a lot over the last three seasons. It's great to see them having fun and getting some rewards for their work. Tajae Sharpe continues to climb in the UMass record book. In contrast to prior years when the defense probably wanted to avert their eyes, Jovan Santos-Knox says the Minutemen offense is fun to watch. Coach Whipple is pleased with the improvement in the defense and with the UMass running game. Matty V. says the UMass defense is coming together. 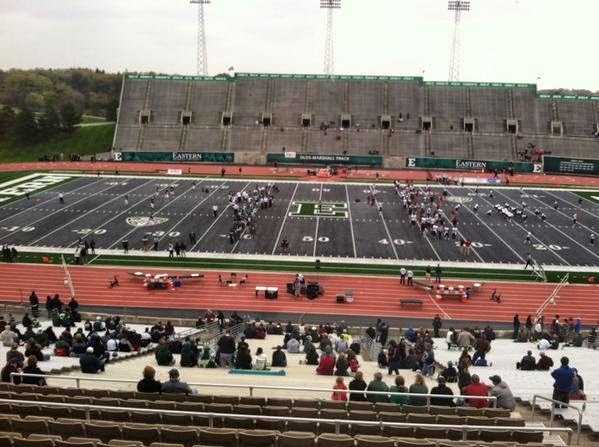 BTW, Eastern Michigan's field came in runner-up for the best field in the nation. Max Moore of Hustle Belt looks at UMass' win over EMU. Philly.com looks at Victor Cruz's injury. More praise for the UMass defense. Maybe for the first time in FBS the Minutemen "D" shut down another team's star player. UMass led the Eagles in first downs 34 to 11. How many times in 2011 and 2012 did we experience the reverse of those numbers? We're still in contention for the MAC East Championship and a bowl game. Twelve fans correctly forecast a 21+ point victory in the weekly scoring poll. EMU's report on the game. Dan Malone has UMass makes it two straight. Shadrach Abrokwah had a career day with four rushing TD's. Dan looks at UMass' improving numbers in MAC conference play. Reggie Bell--non-factor. UMass defense shuts down the Eagles offense. We blew a coverage on EMU's first possession, but after that EMU's offense was not doing much. Matty Vautour reports a balanced offense led UMass to a win. Tajae Sharpe had career days in receptions and yardage against the Eagles. The Globe says UMass wins second straight. The Collegian says Sharpe continues his banner season. The Boston Herald reports UMass has a winning streak. 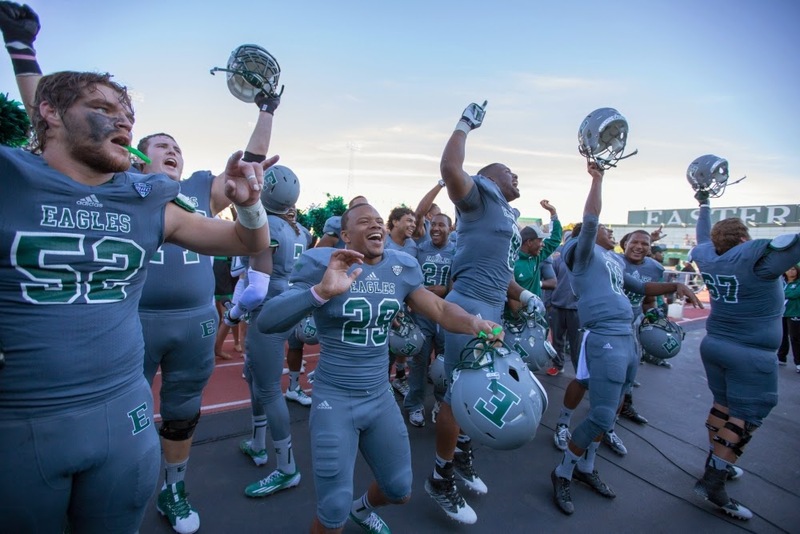 The Eastern Echo says EMU remains winless on the road. All the MAC results here. Some interesting results. Western Michigan beat Bowling Green and winless Kent State handled Army. MAC stats: UMass is 1st in passing offense, last in punting and extra point average. Awesome effort by the defense. The UMass defense held Reggie Bell to 21-40 1.6 yards a carry. EMU had 52 yards in the second half. The UMass offense rang up 34 first downs. We left 16 points on the table, so the score doesn't reflect how much UMass dominated. We're tied for 3rd in the MAC East! UMass write up with box score, quotes, notes and more here. Hey, today is Band Day. It's going to be mostly sunny with highs around 70. Let's turn out and watch the Minutemen start a winning streak. The Minutemen need to put hats on Reggie Bell and keep moving the ball with Frohnapfel and the receivers. Another 150+ yard rushing performance wouldn't hurt either. It should be a fun day at Gillette to tailgate and watch bands from all over New England take part in Band Day. Let's beat EMU and keep a positive buzz going. Speaking of going: Go UMass!!! Thanks to the kind reader who pointed out to me this link from the Boston Globe about Blake Frohnapfel taking care of business at UMass. MassLive has how to catch the game if you can't make it to Gillette. Hustle Belt also has media information about the game. Hey, the MAC Conference website features Tajae Sharpe. Football guru Phil Steele has revised his All-MAC team after half the 2014 season and added four UMass players. Jean Sifrin is first team and Blake Frohnapfel, Tajae Sharpe and Randall Jette are on the second team. Dan Malone previews the UMass-EMU game. 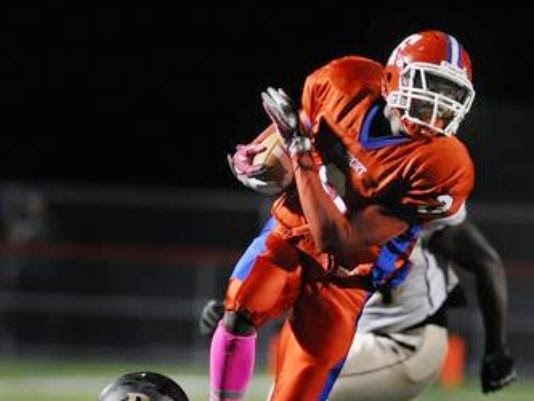 Like the whole Minutemen team, Loranzo Woodley is looking to build off a good performance last week. Phil Steele also named three EMU Eagles (all defensive players) to his Mid-Season All MAC Team. Matty V. says UMass is looking for a second straight win. The Boston Herald says Elijah Wilkinson and the UMass offensive line are coming together. The MAC Conference Game Day post for today. Victor Cruz posts on social media that his surgery went fine and he'll be back bigger and stronger. Giants.com reports Cruz has set goals for his comeback. The UMass alumni site has details of UMass Band Day and a list of all the area bands participating. Dan Malone has his latest podcast with Michael Niziolek of MLive.com discussing Saturday's game with Eastern Michigan. Matty Vautour reports freshman QB Ross Comis as well as Elgin Long and Shaq Harris are all playing the role of Reggie Bell on the scout team as the Minutemen prepare for Eastern Michigan. If it was me, I'd set a priority on containing Bell's ground game. With Frohnapfel at the helm, I don't think EMU throwing for 160-180 yards is going to beat UMass. A Hustle Belt article by Byron Vance says Indiana is the UMass of the Big Ten, or vice versa or something. Prior to EMU's victory over Buffalo, they had a pep rally complete with a live bald eagle. Above video is from a minor league hockey team (the Bakersville Condors) that brought a live condor to a game as a promotion and things don't go quite as planned. David Drew of MLive.com picks the MAC winners for week #8. Akron and Kent State add future OOC games with Nebraska and Alabama respectively. Remember when I talked about the economic benefits that Penn State brings to Pennsylvania? Mississippi is the latest state feel what college football brings. ESPN says after week #7, 32 teams remain in contention for the college football playoffs. Dan Malone reports on Whipple's comments regarding saving A.J.Doyle's redshirt year. Doyle played as a true freshman. Austin Whipple already burned his redshirt year at Penn State. The UMass Daily Collegian looks at the coverage Minuteman WR Tajae Sharpe drew at Kent State. Unlike last year when the Minutemen's offense was Sharpe and Blanchflower and not much else, this year Frohnapfel has a flock of receivers. By my count 16 different players have caught passes this year. Sharpe, Jean Sifrin, Marken Michel, Rodney Mills, and Jalen Williams all have double digit catches. Alex Kenney has 9, but is averaging 19.2 yards/catch.For the first time since we moved to FBS, we have players that other teams have to game plan to contain. The Collegian also looks at UMass' plans to try to contain dual-threat EMU QB Reggie Belle, Jr. The Eastern Echo says the Eagles are eager to continue the second half their season the same way the first half ended. Reggie Bell was named to the Manning Award Star-of-the-Week list for his performance against Buffalo. EMU's helmet design through the ages. Max Moore of Hustle Belt looks at the Minutemen's first win. Jesse Allen and Alex Alvarado talk smack about the Eagles-Minutemen game. Brandon London pulls in a TD as the Larks crushed the Roughriders. Check out this story from Football Scoop on Kentucky's new football training facility. Man, the outside looks different, but the inside is a clone of UMass' performance center. I mean exactly, like the performance center. Quote from the article:"It’s scary to think the type of recruits Mark Stoops and his staff will be able to pull in once this is finished." The Buffalo Bulls try to keep focus on the remainder of the 2014 season after the firing of HC Jeff Quinn. The NY Daily News says Victor Cruz can become a source of inspiration for the G-Men. Tom Coughlin "absolutely" believes Cruz will return as a top receiver. UMass has its game notes for EMU up. Lorenzo Woodley was named Co-UMass athlete-of-the-week for his 28-160 yards against Kent State. Eastern Michigan also has its game notes for UMass posted. Eastern Michigan scored two MAC players-of-week as QB Reggie Bell and LB Anthony Zappone were named the MAC's offense and defense honors squad for their performances against Buffalo. USA Today ranks EMU's Ryneanson Stadium with its gray turf as one of the top ten in the nation. Football Scoop looks at the MAC and Sunbelt at mid-season and has some positive words about UMass. If you missed it, while UMass was stopping its loss streak, Central Michigan broke NIU's 28 game home winning streak. Terry Bowden is turning the Akron Zips into a winner in his third year. We can hope they'll be writing articles like this about Whipple in 2016. The Buffalo Bulls want to hire a high profile coach as Jeff Quinn's replacement. BTW, Blake Frohnapfel's old school Marshall, is undefeated. The Wall Street Journal reports that Mississippi State is #1 and the Bulldogs are doing it with modest financial resources. In only seven games, Blake Frohnapfel is close to or already in several UMass single-season passing records. Frohnapfel totals are currently 135.3 EFF 157-286-5 2146 54.0 % 18 TD's 306.6 AVE/game. Great minds think alike. I wrote the above before checking today's media links and Dan Malone reports on Blake Fronapfel by the numbers. Coach Whipple quotes from the Monday MAC coaches teleconference. Jean Sifrin has been added to the mid-season John Mackey Award watch list. Dan Malone has a post on Sifrin's season. Dan also asks if Logan Laurent is the answer at kicker. The UMass Daily Collegian says the Minutemen seek consistency in this week's practices. UMass opens at a 14.5 favorite over Eastern Michigan. UMass' win over Kent State does not do much for the Minutemen in the Hustle Belt Power Poll. Matty V. says Whipple indicated that Matt Sparks, J.T Blyden, Shadrach Abrokwah and Marken Michel are all on the mend and may play Saturday. He also says Kent State safety Elcee Refuge (good name) has been suspended for the first half of the Golden Flashes next game after being ejected from the UMass game for a late hit. Buffalo fired coach Jeff Quinn, a move Matty Vautour calls odd. The Buffalo News reports on Quinn's firing. The NY York Daily News says Victor Cruz will likely never be the same. USA Today says the Eagles fans did not gloat. Then again drunk Eagles fans stole a prosthetic leg from a disabled veteran. Lorenzo Woodley is the focus of this article by Matty Vautour. Woodley's totals of 50-228 4.6 AVE 3TD 43 LONG 45.6 AVE/G lead the Minutemen. His breakout game last Saturday of 160 yards was almost 18% of UMass' rushing total for 2104. The feature back in Whipple's offense gets a lot of carries. The job is waiting for the running back who grabs it. Dan Malone has five takeaways from the Minutemen's win on Saturday. The UMass website has video highlights from the game. The Boston Herald says UMass should schedule more games in Ohio. Rant Sports says congrats to UMass for breaking the streak (scroll down). Eastern Michigan QB Reggie Bell is the former Los Angles 110 meter high hurtles champion. The Eastern Michigan student newspaper has mid-season grades for the Eagles. 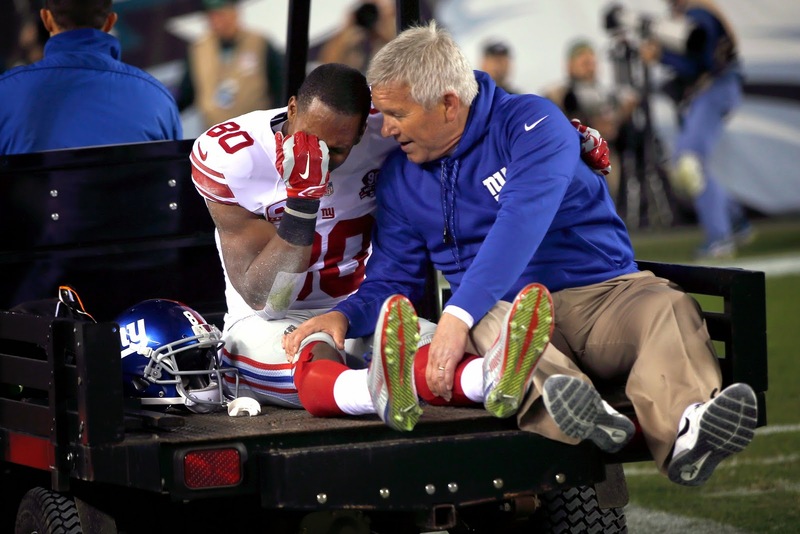 Victor Cruz tore his patella tendon during last night's loss to the Eagles. A Philly sports talk jock celebrates. The Minutemen broke through yesterday. First, they cut down mistakes. No fourth quarter turnovers. Then some players made football plays. Kassan Messiah blocked a field goal to stifle any Golden Flash comeback momentum. He led the the Minutemen with 10 TT 1 TFL and 1 QB Hurry. Then Lorenzo Woodley carried the ball seven straight times and went 80 yards for the clinching TD. That was a Marcel Shipp type of performance. Jackson Porter got some revenge as he added a pick-six to add to UMass' fourth quarter dominance. The kicking game was better, not a weapon mind you, but a big step up from tear-your-hair-out bad. At least we can kick a 20-yard field goal. Matty also has backup punter Logan Laurent moves into a starting role as kicker. Matty V. says UMass snaps 12-game losing streak at Kent State. Dan Malone says victory was sweet for the Minutemen. Dan also reports on Lorenzo Woodley's 23-160 rushing day. The Boston Globe says UMass earns its first victory of the season. The Boston Herald reports UMass tastes victory. The UMass Daily Collegian said it was a beautiful feeling. The Cleveland Plain Dealers says Kent State drops yesterday's game to UMass to remain winless. Eastern Michigan got a historic day out of QB Reggie Bell as they upset the Buffalo Bulls 37-27. Buffalo News says the Bulls were ambushed in an upset. EMU freshman Reggie Bell answered the call. Yes!!! 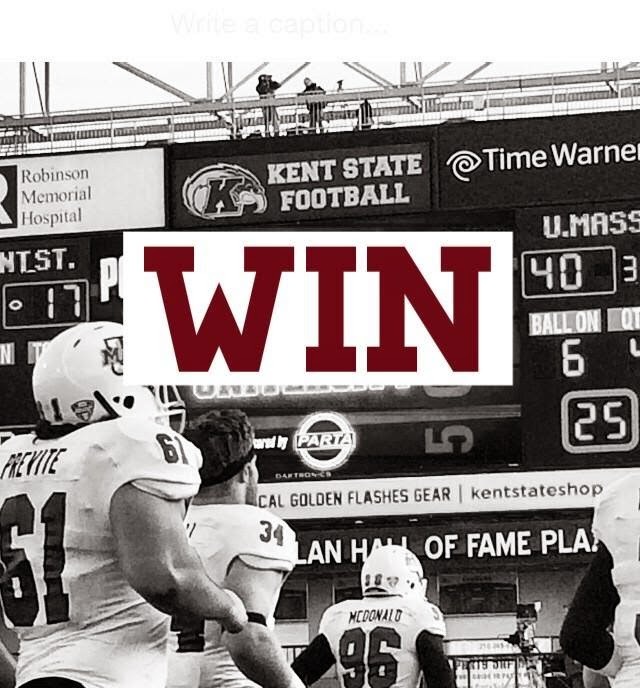 UMass 40-17 over Kent State! Box score and audio interviews here. Well, at least I get to watch the game on ESPN3 today. I had a bad feeling about the Miami (Ohio) game all day last Saturday. I think I may still have an UMass "National Champion" t-shirt somewhere. Maybe I'll wear that while watching to see if I change change the Ju-Ju. Kent State is a team with a formidable defense. They've been in most games they've played. The Minutemen need to stop those second-half turnovers. Anytime you turn the ball over three times in the fourth quarter, you're going to have trouble. Jimmie Reid use to talk about responsibility. Each player's job is his responsibility. Play your position and let everyone play theirs. Stop the turnovers and, when needed, kick the freakin' ball through the uprights. UMass players and fans have certainly paid their dues. Losing is making everyone crazy. Let's break through and win today. Hustle Belt has all the media information for the game. Matty V. says the UMass defense is preparing for the unknown at Kent State. Dan Malone says quarterback questions linger over the Kent State game. Fan Sides says UMass has got to break through one of these weeks and thinks the Minutemen will top the point spread. Hustle Belt also thinks UMass will beat the spread. MAC Conference Game Day details here. Not a lot of media coverage on today's game between two 0-6 teams. So OT, I'll express my sorrow to hear of the death of Lari Ketner. Thirty-seven is much too early. Ketner was a giant of a man who always seemed to have a distracted air when he played for the Minutemen. I was glad to hear he had found peace at the end. Alan Moff joins Dan Malone in the latest UMass football podcast. Dan grades the Minutemen after a disappointing 0-6 start. He also has five players to watch in the second half of the season. Matty V. says UMass is trying to shake up its routine. Jesse Allen of Hustle Belt says change is coming. Max Moore previews the UMass-Kent State game. The Boston Globe says UMass came agonizingly close to winning. Kent State has its game notes for UMass up. Michael Cox is now the #3 running back for the Giants. ESPN says Victor Cruz and Odel Bechham are teaming up on a suddenly potent Giants offense. USA Today reports college officiating is increasingly in crosshairs. The odds for the UMass-Kent State game are down to -1 for the Golden Flashes. The Next home game will be at Gillette and and it'll be UMass Band Day. Nearly a 100 Northeast HS bands will join the UMMB for a 3:00 PM kickoff. That should be a hoot. Even for Band Day nearly 100 bands should be some kind of record. The Band Day page from UMMB's site. The UMMB put on their best performance of the season on Homecoming, so I'm looking forward to what they do next. UMass has its game notes up for the Kent State game. Dan Malone has his MAC power ratings after last week's results. He also reports Trey Dudley-Giles and Rodney Mills are expected to return to practice. Mills has been a big beneficiary of Whipple's new offense. 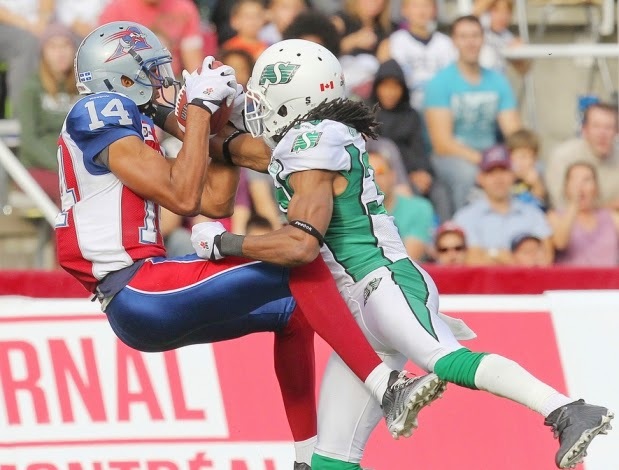 This year, Mills has gone 13-244 18.8 AVE (highest on team) 5 TD's (Also highest) 60 LONG and 40.7 ave/game. Dan has three up and three down from the Miami (Ohio) game. The Press-Herald say Andrew Libby is getting playing time for UMass and enjoying every moment of it. The MAC Blog Hustle Belt has a podcast featuring Dan Malone and talks UMass football. Matty Vautour also has UMass updates and some material on Kent States quarterback injuries. Matty also reports John Griffin has been signed by the Omaha Mammoths, a new semi-pro league. Griffin also spent some time with the NY Jets. The UMass Daily Collegian reports the Minutemen will face uncertainty this weekend against the Golden Flashes. After a 1-4 start, Ball State makes a change in QB.